Today I’m a tourist. I got up late, and I went out with just my man-bag containing camera, videocamera (unused) and my book. The weather is glorious, 19º C in the shade and very few and inconsequential clouds in the sky. My heart goes out to my friends and relative in Europe and the cold and wet conditions they are enduring. Don’t worry you’ll get the last laugh when you’re tucking into the Christmas meal and I’ll be having stale bread and tuna from a can in the middle of nowhere in three weeks time. 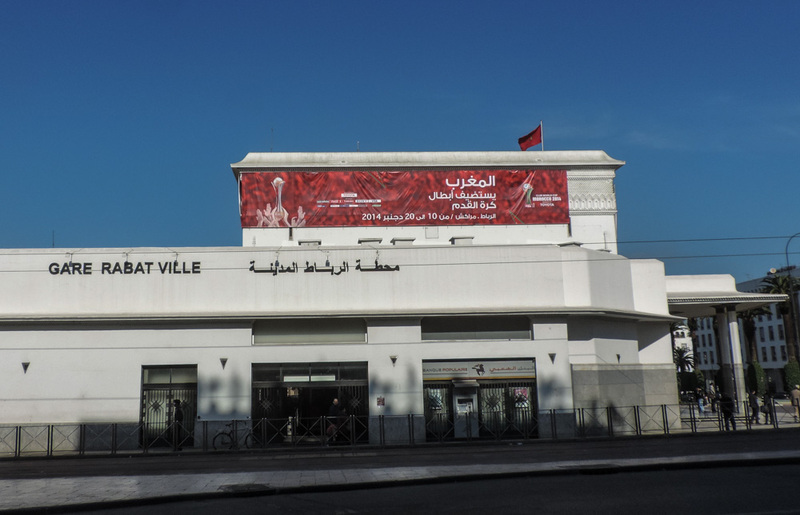 Rabat going Mundialito crazy from mid week. 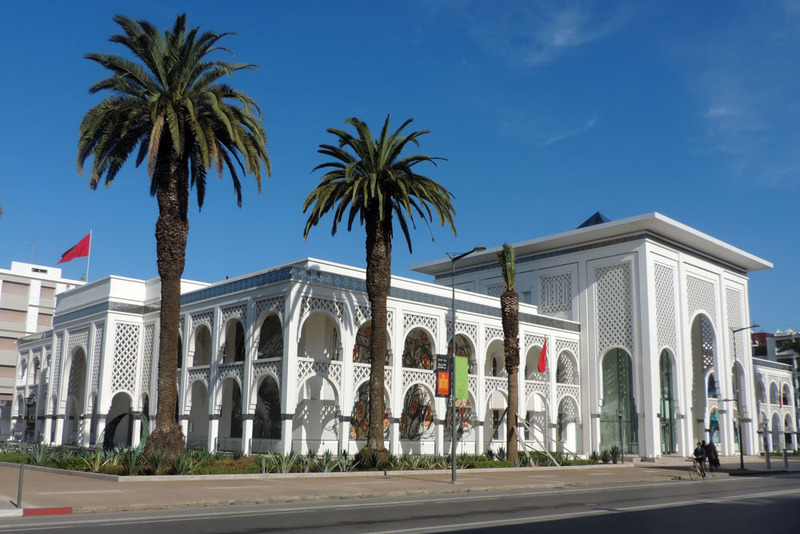 Rabat is truly a change from what I’ve seen so far, it feels a little bit more like the south of Spain but also it has a distinct French architectural feel. Apparently the whole “new town” was developed by the colonial power. The sad thing is that the colonial power seems to be the only entity that has done something to the place in a long time. 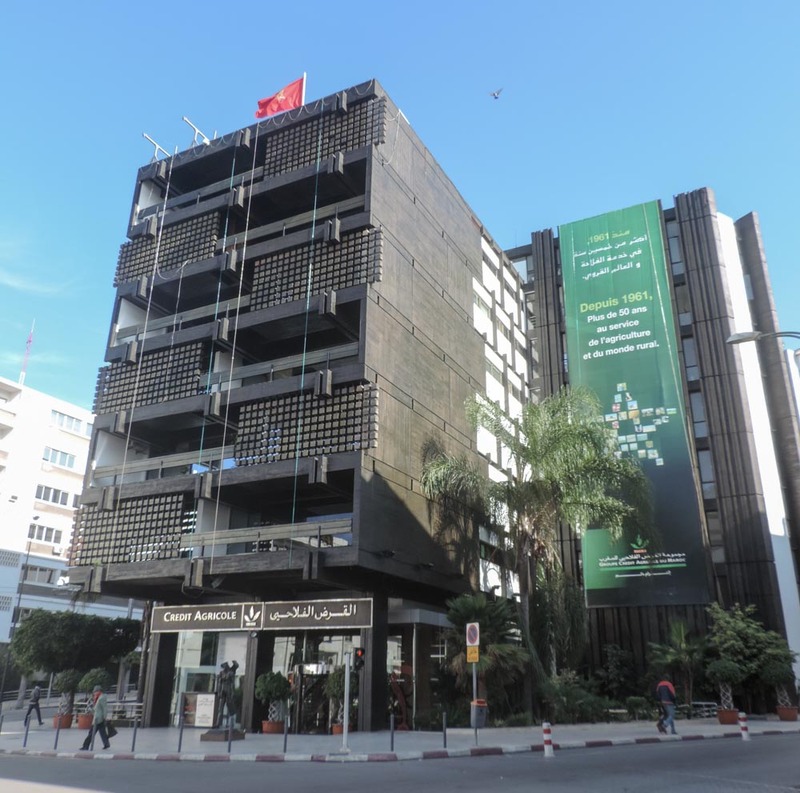 There is a bank building at the bottom of Avenue Mohammed V that is being redeveloped. Outside the development site there are barrier that display the whole avenue in pictures of the thirties and forties, and it was splendid. Let’s hope that they manage to resurrect the class and stile of the times. As a small digression let me tell you a few facts I have learned about Africa that fit the experience I have made so far of it. 70% of African workforce contributes 3% of Africa GDP through agriculture. The chronic inefficiency of agriculture is one of the reason why Africa cannot feed itself and therefore makes it toil escaping the clutches of underdevelopment. While the GDP growth for the continent is currently 9% this growth is totally energy free growth, i.e development arising out of the exploitation of row material, and therefore destined to reduce and stall unless some degree of industrialisation takes place. For that Africa needs energy production and distribution. Currently the continent produces the same amount of energy as Spain and Belgium put together. Then there is road infrastructure, and this is going to become an issue for me more and more as I get south. The African road network is as extensive as the Colombian road network. Not bad ah? a continent compared to a country. On the bright side Africa was really not affected by the credit crunch and the banking collapse of 2008, unfortunately this was due to the fact that they hardly lend to business and they are chronically conservative offering little leg up for the development of the continent. My good wife would not be proud of me but I passed an opportunity for savouring some art, I limited myself to taking a few pictures of the museum of modern art and carried on with the exploration. I admit that architecture and people watching, if not interacting, are more of an interest to me. In fact one of the most interesting things in the city is the juxtaposition of antique with modern, of old with new. 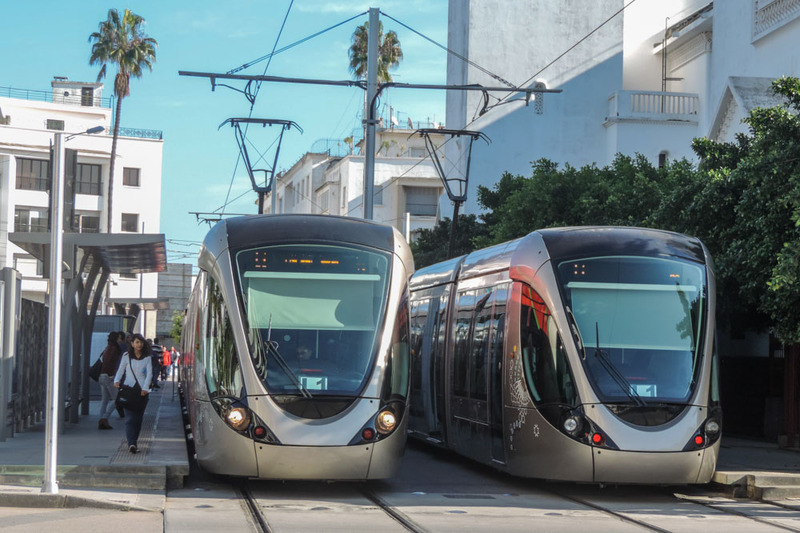 While the medina and the seafront with the kasbah are old and antique there are new interesting buildings and indeed a tram system crossing most of the city. Amazingly from the distance this looked like it was unfinished, how wrong and how interesting. Edinburgh, eat your heart out. After crossing the new town I spent a little time watching people and writing on my notebook in the Jardin Nouzhat Hassan. The park, which is in the centre of the city, is lovely and all the bench are under the tree which I guess will be a wonderful thing in the summer, but it’s not necessary in early December. The garden are full of people, an incredible array of completely westernised kids and fairly traditional old chaps. Nobody is harassing anybody and the floor venders wait for you to ask before they talk to you, this is a milion miles away from the Morocco I’ve seen so far. Mmm, should we stay or should we go? The passing from the new town to the medina however brings me back to the reality that this is no Europe. Still people are different from the ones I met in the countryside or even in El Araich. There is no hassling, no harassing and not the need for the long haggling routines if you buy something, perhaps I’m missing out on deals or perhaps it’s just I’m buying low value items that have little room for negotiation. There are some things though that hit the eye of the bleach enthusiastic European. 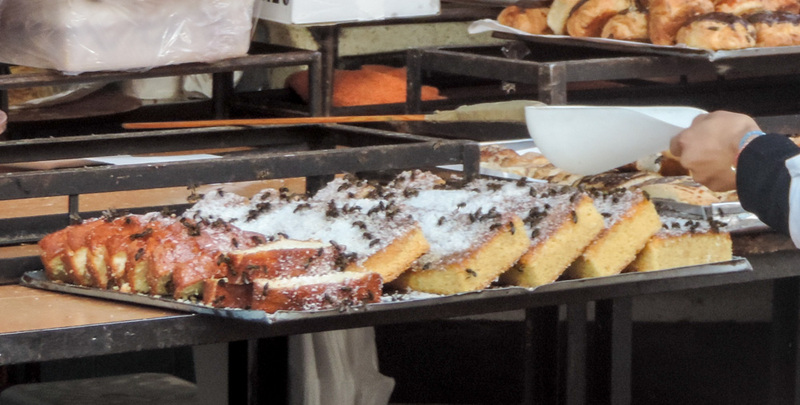 Would you like some cake with your flies madam? Oh sorry, did you not see them? And this is what they do with the goat’s head, I knew it there was a use for it. 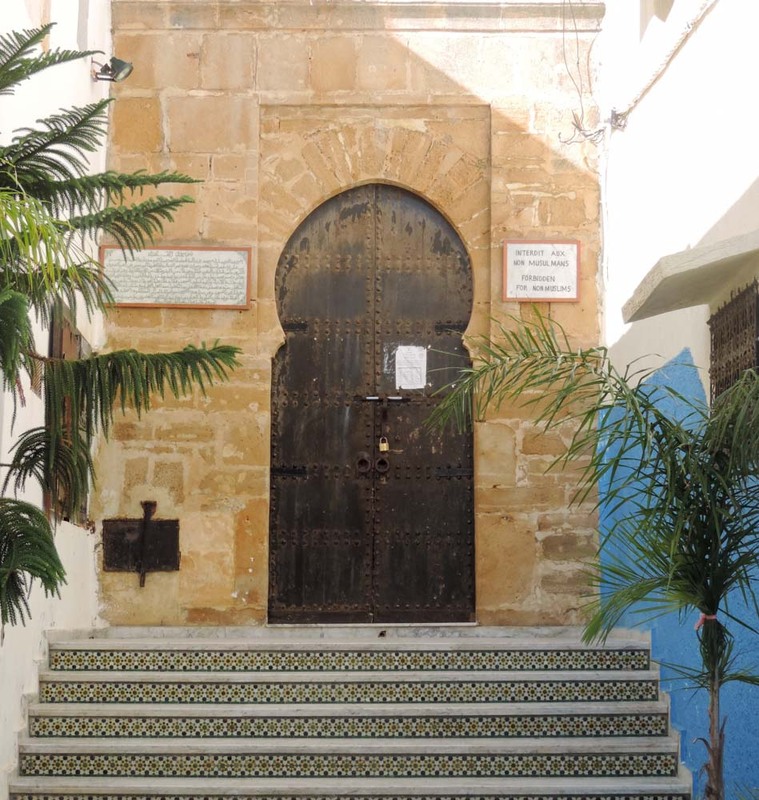 The medina is a vast and is split in two parts, business and living. 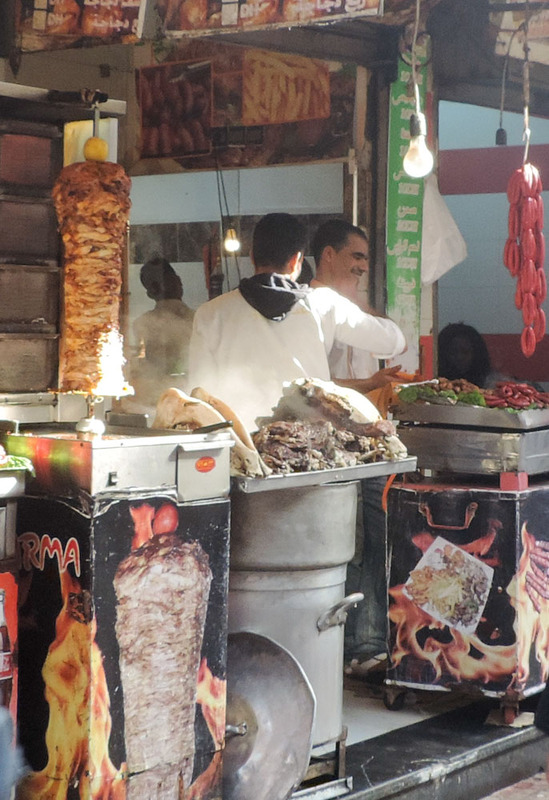 There are three main drags which are basically like a massive open air market with shops arranged in three lines, Left side of the road and right side of the road are the brick based shops and the middle of the road is occupied by the movable stalls. Every so often the police seams to move in and move about the stalls who decamp and re-camp five metre down the line. In some bits the road narrows and there are no stalls in the middle. 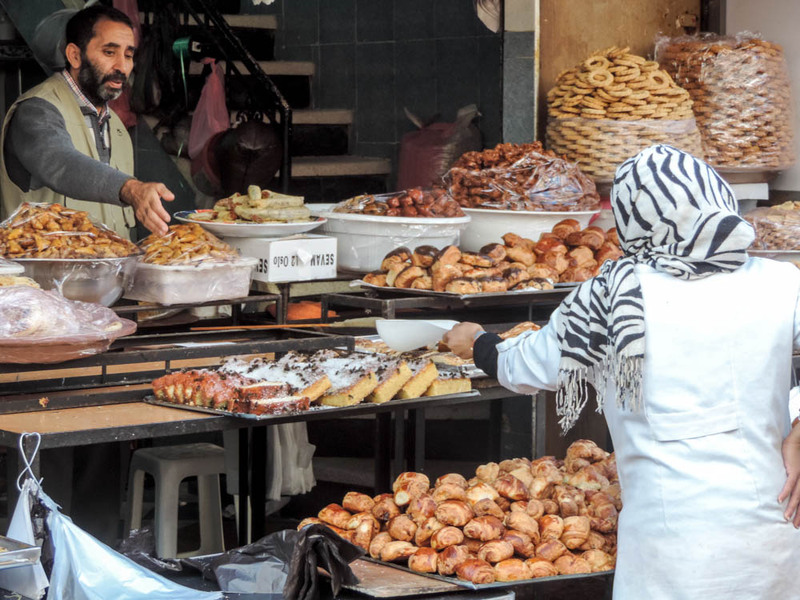 It almost feels like every person in Morocco is running a business. The places where the goods are more valuable get a roof and, understandably there are less people to fight with. The mix of stuff you can buy is remarkable, and it’s not all rubbish, but I have no scope for buying anything other than consumables otherwise the Holmfirth police will get me. I however went in a shop to search for a tool to tighten the pedals of the bike, I kind of knew they would not have it but I thought they might have pointed in the right direction. In the end they pointed me to the out of town equivalent of B&Q but not before they asked me to write a few lines about what I was doing and taking my picture. I thought it was about the fact they had never seen Santa before but it turns out i have become part of part of something bigger. I left them one of my cards and that must have pointed them to my handle on twitter, shame about the surname spelling, but I’m used to it somehow. I went along the two main roads and I took less pictures than I could have but I feel still a bit weary of making myself to obviously tourist looking. On the other hand I must be doing something wrong as the only person that approached me tried to sell me drug, I don’t think they do that to locals. South of the medina there is the kasbah. 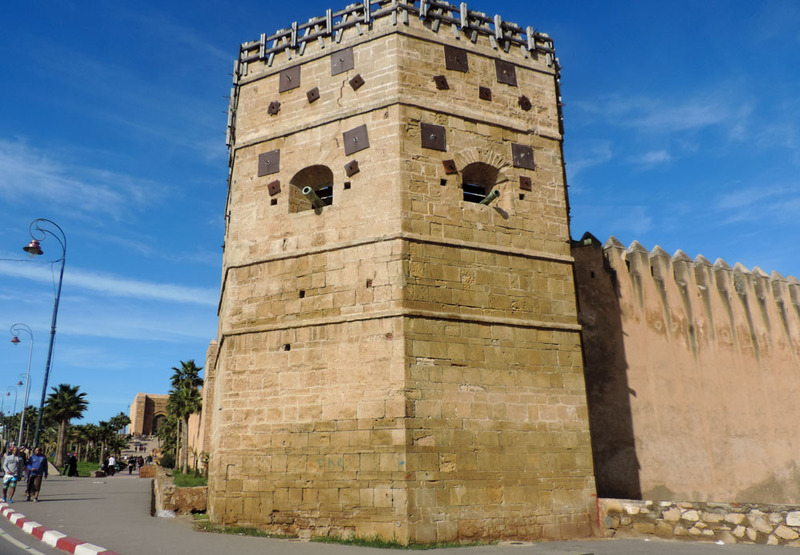 Impressive corner turret in the kasbah. I went in and roamed around. I declined the offers for a guide which would have been in French or Spanish. 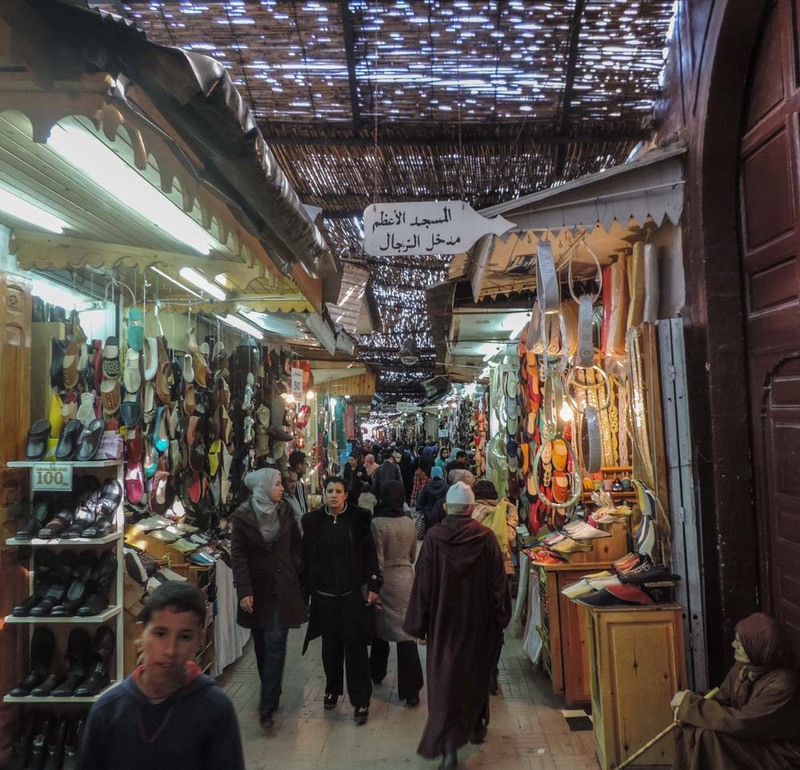 These guides were part of what I would call the informal economy and what surprised me is the lack of offer for either English, the world language, or Italian, considering the vast number of Moroccans that spend long stints of time in Italy. 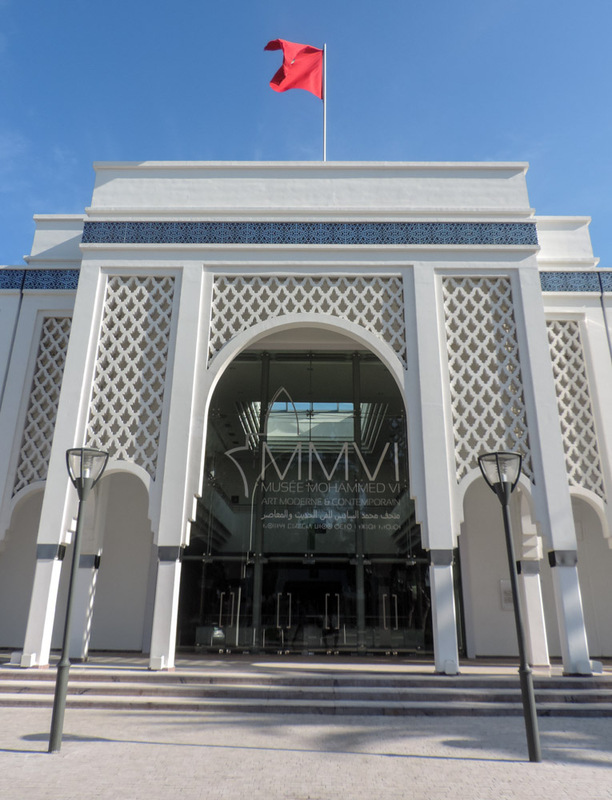 I stopped in the main square inside the kasbah and read a bit of my book and I remembered a passage of it I read a few days ago which, in line of my most recent experience, is very autobiographical. The mismatch between Sal Paradise plan of a journey and the reality of the journey itself reminds me of my first few days in Morocco. I guess I’m not the only one who ever got frustrated by travel hiccups. 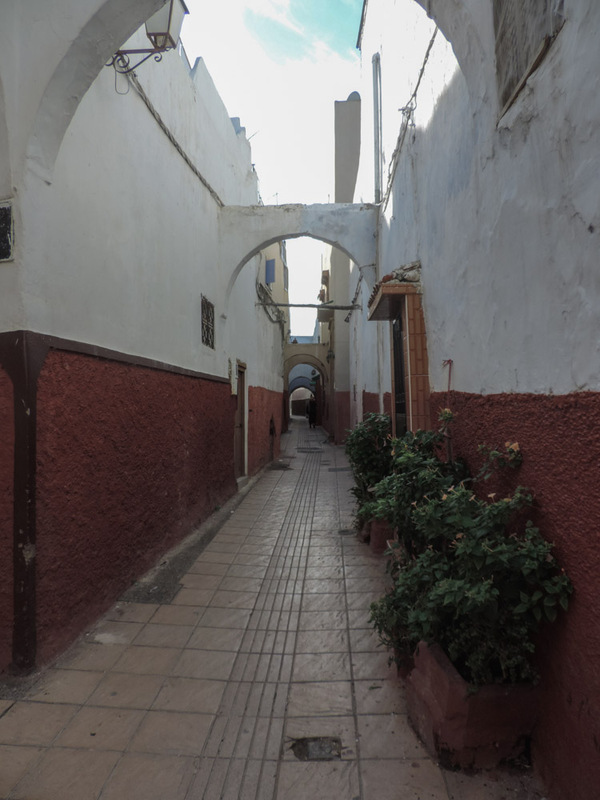 After I left the kasbah I had to go back through the medina to get to the hotel so I decided to go through its back part, the one that is just about living quarters. It is very narrow and the buildings are very old but it is very nice and tidy and the people are very friendly. 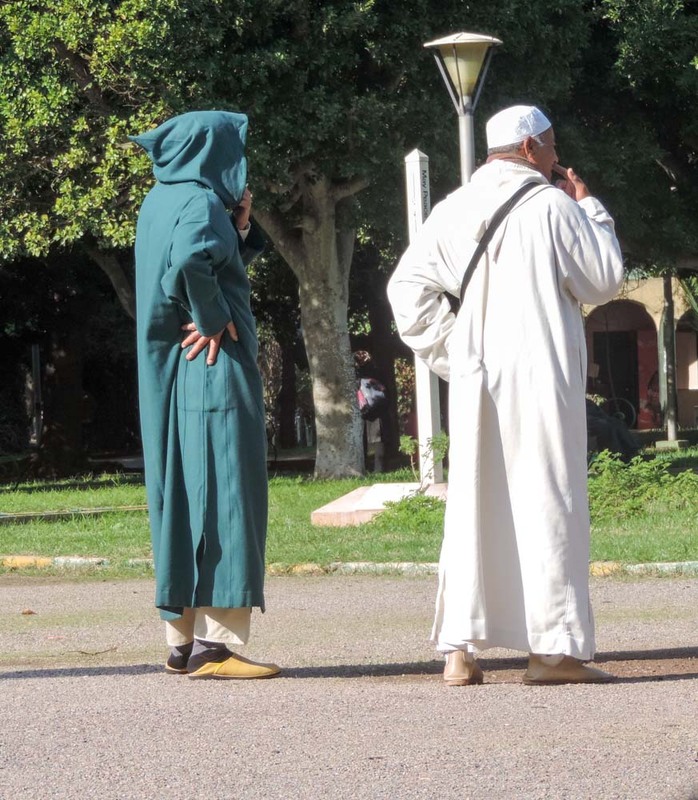 I stopped talking with a chap, talking being an overstatement on my part as my French is a bit so so, and I discovered that there are centres in the medina that offer a six months arabic course for foreigners where you live with a family and are fully immersed in the language and culture. It costs near to nothing, based on European expectations and they guarantee that in six month you will be fluent in both spoken and written arabic. 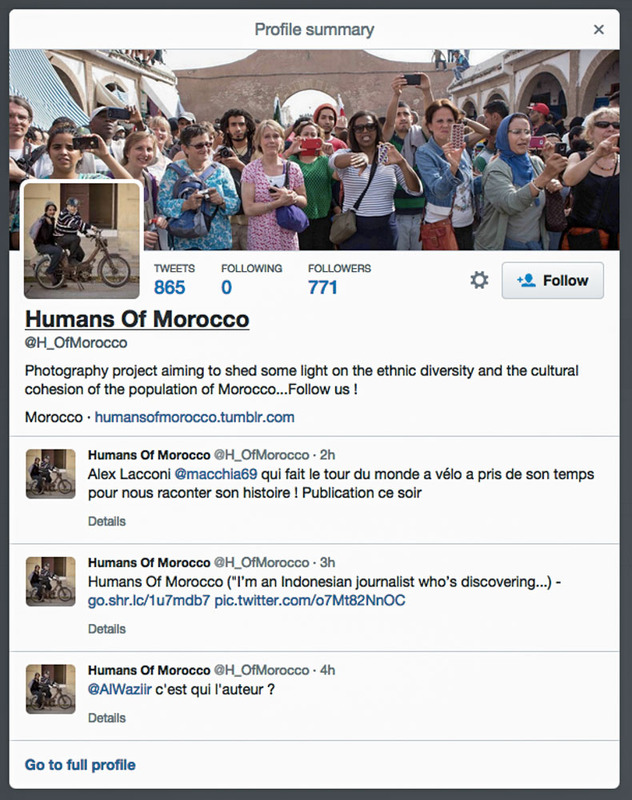 Something one might think of doing when it becomes viable to spend time in the arabic speaking world. This is where people live in the medina. 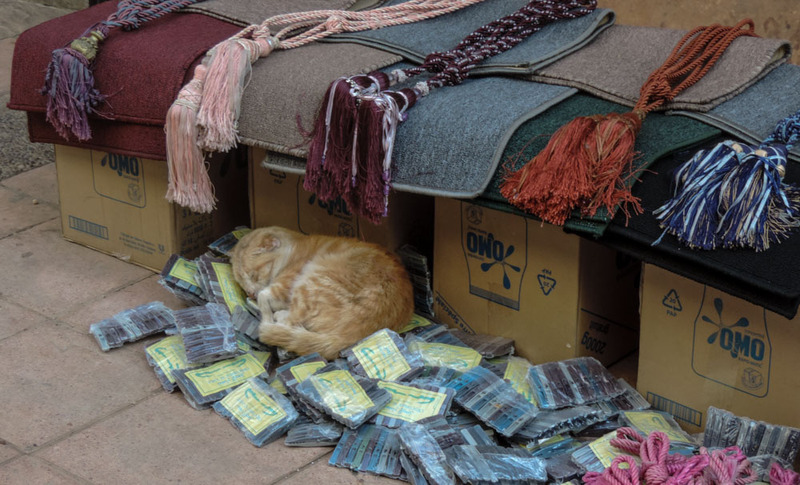 I finished the walk by purchasing some bread and some olives at a mighty 8 Dirham expense, but that gave me the opportunity to stop and marvel at the confort that the cats experience in Morocco. There was actually another cat that I did not take a picture of earlier on that would have had you in stitches. It was licking a display of fresh fish being laid for sale on the floor at a crossroad of the market, yum, lucky cat. Asleep in the shop window. Holmfirth Police are watching you! Ma non erano mosche…era uva passa! Io mi sento meglio disposta ad affrontare l’inverno alle porte piuttosto che affrontare il magreb!